Slice the flank steak in half against the grain of the meat. With your hand on top of half of the steak, run your knife through the steak between your hand and the cutting board, slicing the steak into 3 very thin sheets. Repeat with the other half. Salt the steaks and spread 1 tablespoon of mustard on each. Evenly divide the rest of the ingredients on the steaks, laying them out thinly. Pickles and onions first, then the cheese and ham. Tightly roll into spirals and secure with twine or skewers. The grain of the meat should run from end to end, not spiraled in the roll. Put in a baking dish and add beef stock to about a half inch from the bottom of the pan. Bake for an hour and 45 minutes at 300°F. Slice into pinwheels and serve. It is important that the meat is cut correctly (against the grain) to be tender. 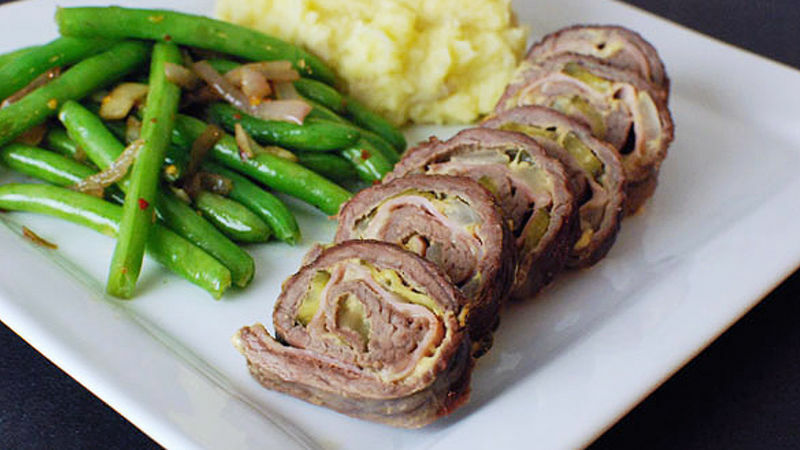 Rouladen is a delicious German dish, basically a meat roll filled with tasty things like pickles and mustard. I was revisiting it recently, trying to think of a creative spin I could put on it – when I remembered another dish I love that also stars pickles and mustard: The Cuban Sandwich! So this time I loaded up the flank steak with everything great about Cuban sandwiches: pickles, mustard, ham, and Swiss cheese. The Cuban Rouladen came out fantastic, with just the right amount of influence from each of the two dishes. Served with some quick mustard mashed potatoes and garlic green beans, this made a simple yet satisfying weeknight dinner. I cut the flank in half, then sliced it into very thin sheets. Spread mustard all over it, then add pickles and onions. This made me crave a hot dog! Ham and cheese go last. Then roll ‘em up! I used oven-safe rubber bands to hold them in place. These baked an hour and 45 minutes at 300 degrees. It is important to slice these in order to make the flank steak more tender. The potatoes were mashed with some butter, milk and a few spoonfuls of mustard. The green beans were made with caramelized onions and garlic. Beautiful and elegant, but easy to make. Dan Whalen has transformed Cuban Sandwiches into pizza and lasagna at his website The Food In My Beard; check Dan’s Tablespoon Profile often to try his recipes with creative international spins!